The Association of Christians Ministering among Internationals (ACMI) annual conference, Many Parts One Body, will be held on the picturesque campus of Regent University in Virginia Beach, VA, June 8-10, 2017. This year’s conference will feature plenary speakers Dr. J.D. Payne, Dr. Sasan Tavassoli and Lisa Espineli Chinn. In addition, there will be many breakout sessions (workshops) by topic related to ISM, informational displays and resources, and networking with others engaged in this strategic work. 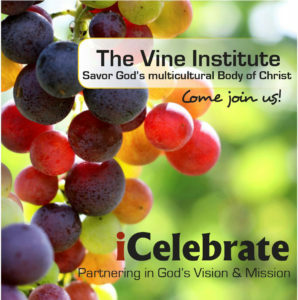 Come and join The Vine Institute, an EAN member organization, for an evening of celebration and community. Together with hundreds of other believers from all over the world, experience, taste and participate in what God is doing in Salt Lake City through The Vine Institute. You can be an important part of this awesome ministry. Come and celebrate with us! Interact with church volunteers, international student ministry staff, and Christian International Student Services professionals of colleges and universities at the InterGen Global Forum that precedes the meeting of NAFSA: Association of International Educators. Click here for details.